A few Sunday’s back, Michael, William, Hash, and I, decided to have a ‘Sunday Fun Day’ at an old favourite of Michael’s & mine, Eight over Eight. 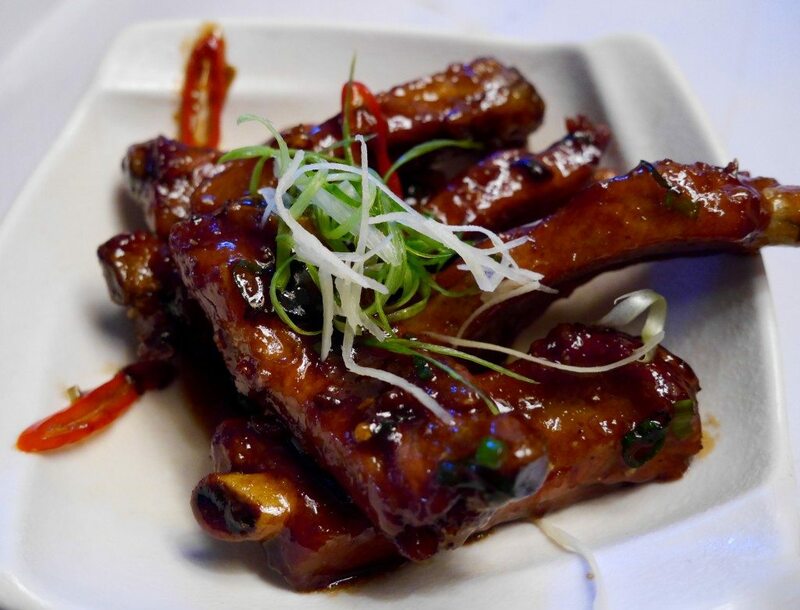 Although always keen for a spot of fun, the main reason that we chose to dine on a Sunday is because the restaurant offers an outrageously good deal of 40% off its delicious Asian food every Sunday! 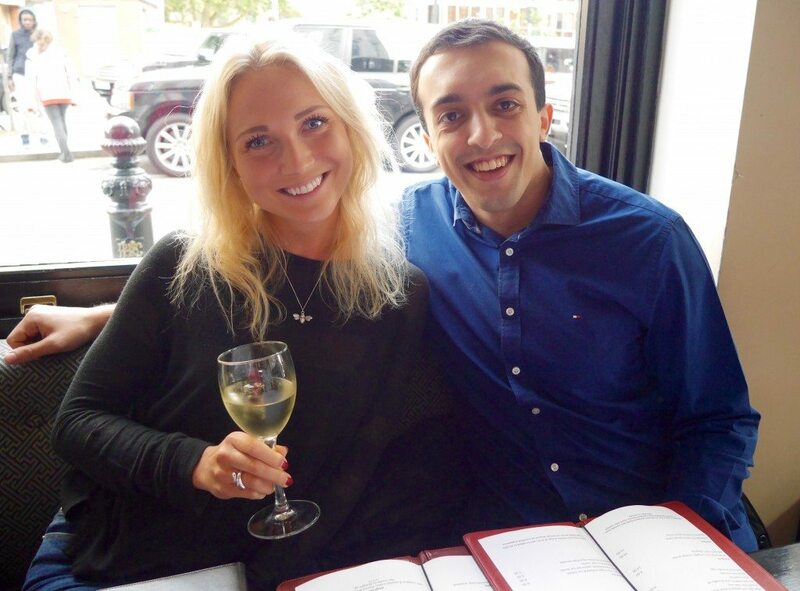 Hence when Michael lived in Notting Hill, we would regularly scoot over to the King’s Road for our Sunday dinner but, since moving east, we haven’t been back – so a visit was long overdue! Service: Although I’m aware that people regularly comment on the poor service at Eight over Eight, it’s not something that I’ve personally ever had a problem with. 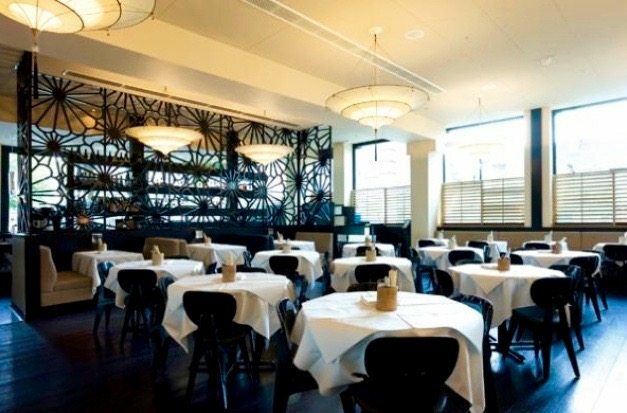 When Michael and I used to go regularly, we had a good rapport with a few of the waiters whom we grew to really like but, sadly on this occasion, we didn’t see any familiar faces. Unsurprisingly, the fantastic Sunday deal pulls in the punters and there is always a full house, which can make getting your waiter’s attention a little tricky at times. However, I feel that this is a minor gripe in the grand scale of things and, once you do have their attention, we’ve always only had friendly & efficient service. Though I will say that the food ‘comes as it’s ready’, so I would advise staggering your orders; a lesson well learnt first time round! 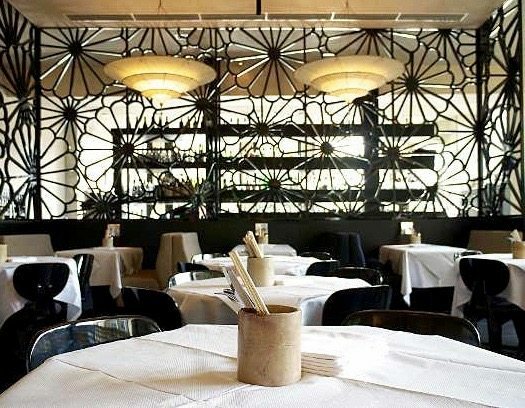 Ambience: I really love the dining room, which to me is an upmarket version of your local Chinese restaurant, courtesy of the decorative flower partition wall and oriental paper lampshades. Yet they can’t run away from the messy style of food that they serve, hence the greaseproof table covers atop every white tablecloth, which makes me & my clumsiness feel much more at ease when having to deal with ribs, and so on. I’m also a huge fan of booth seating and banquets, as I find them so much more intimate and, of course, comfortable. Also, despite the rather tightly packed tables, I love the feeling of space that the room has from the tall ceiling. On the other side of the pretty Chinese-esque room divider (at the front of the restaurant) is the attractive & well-stocked bar. Be sure to arrive early, as Eight over Eight is just as popular for a drink as it is for food, and chairs are limited! 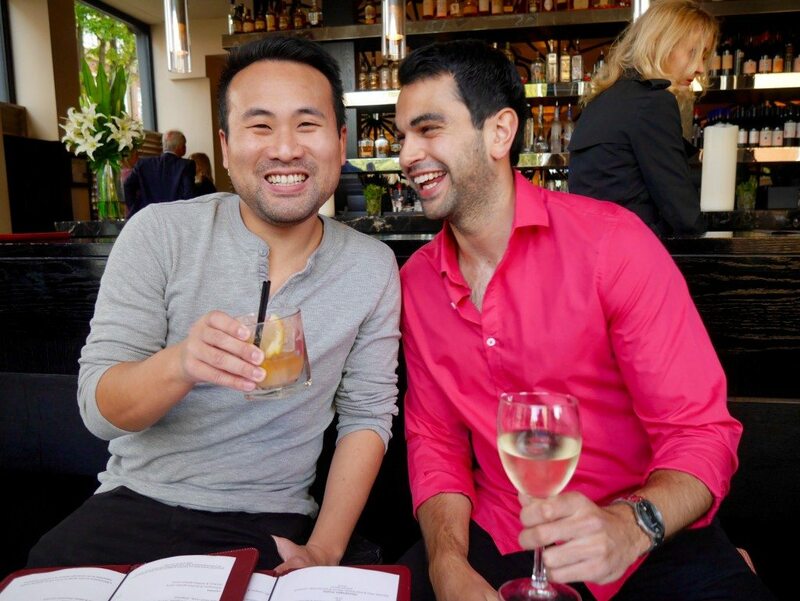 Since we did just that, and in light of the gorgeous summer’s evening streaming in through the large floor-to-ceiling windows, we decided to have a couple of drinks in the bar before moving to our table. Drinks: Michael and I were first to arrive, and wasted no time waiting for the others. 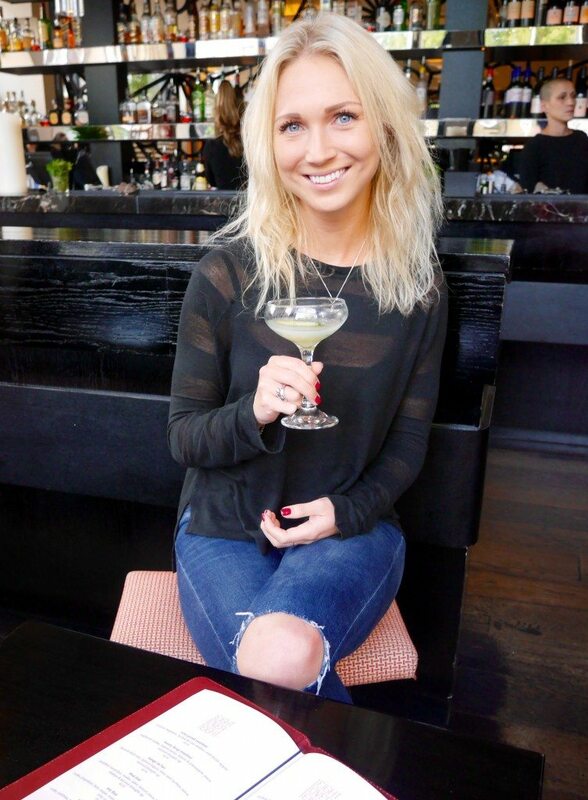 I had a Thai tini (£8.50), consisting of muddled cucumber, 42 below vodka, sake, lemon juice & sugar, which was super refreshing and rather delicious. Michael stayed on a straighter path, ordering a glass of house white wine (£5.00). The three of us were slurping up the last of our dregs and ordering another round of the same (£22.00) just as Hash arrived (perfect timing! ), who ordered a Thai tini on my recommendation (£8.50). Food: Having suitably quenched our thirst, it was time to feed the tummies! We moved to our swanky booth and set about ordering all of mine & Michael’s old staples, plus some newbies. FYI, the prices listed after each dish are the usual full price, so you can deduct 40% if you plan to dine on a Sunday (suddenly making the food very, very reasonable… and your eyes much, much larger than your stomach…). We started with dim sum. Round 1 being two orders of the chilli salt squid (£7.50 each), two orders of the prawn & black cod gyoza (£7.00 each), and one order of the crispy pork belly with black vinegar (£8.00). 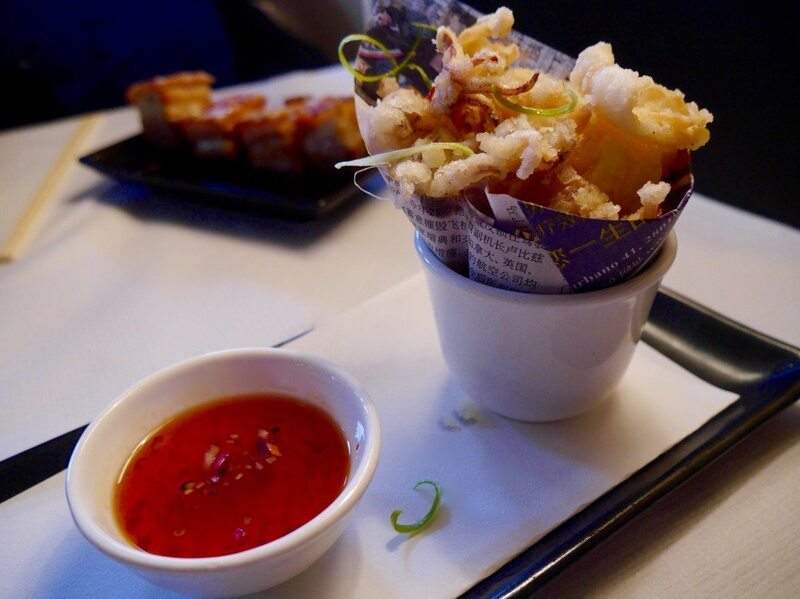 The chili salt squid was good, with the squid cooked well and the batter light. I do love me some sweet & sour too. I’ve had better, but I’ve most definitely had worse. 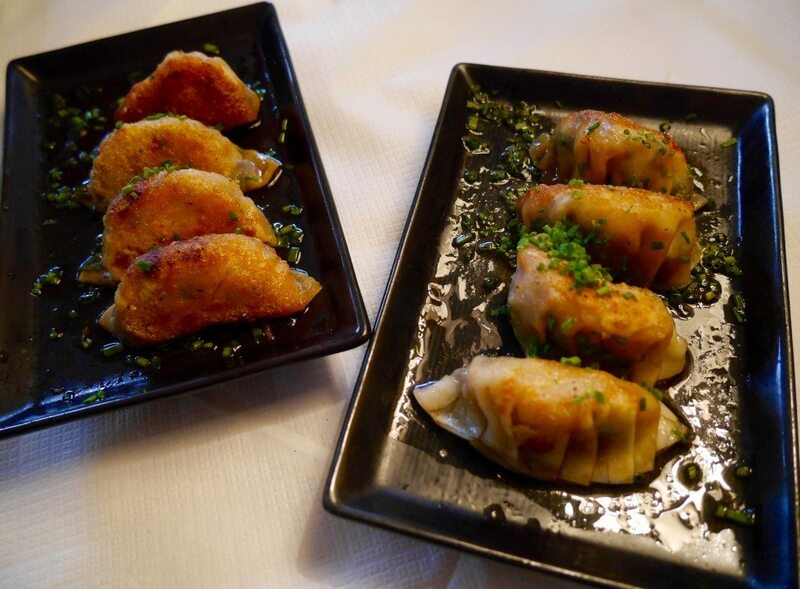 The prawn & black cod gyozas were fantastic. Deliciously ‘meaty’ with generous filling, great flavour, and perfectly greasy (trust me), swimming in a delectable sauce. 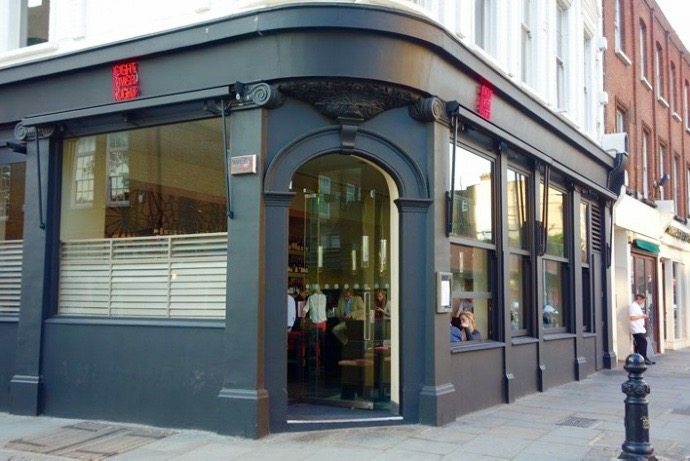 I think they might even be better than Roka’s – shock horror!!! 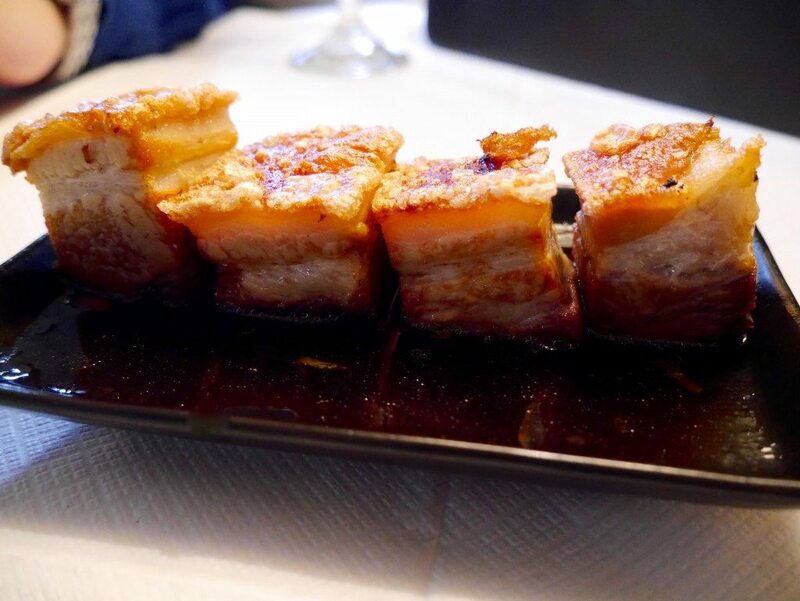 The crispy pork belly was cooked to perfection. Michael and I have had this dish many times before and I must say that it has been a bit hit & miss in the past but, on this particular occasion, it was entirely on point. The porky squares had a spot on ratio of meat to fat, with a thick layer of chewy-crisp crackling, the richness of which was balanced beautifully by the tangy vinegar. The only issue with these delightful little fella’s is deciding whether you’re going to try to bite them in half or shove them whole in one – unfortunately, neither way is pretty (but it is worth it)! Round 2 was equally as filthy good. 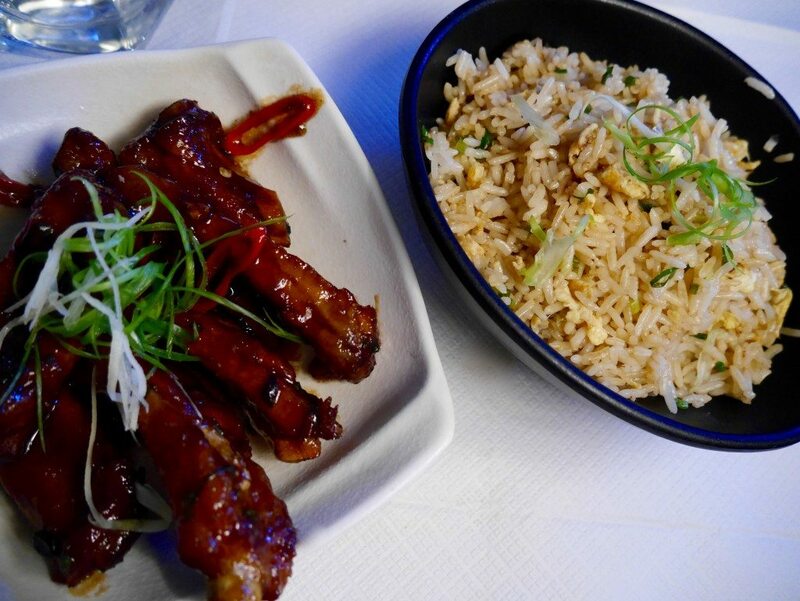 We had two orders of the spare ribs with black bean (£8.50 each), which we scoffed with two portions of egg fried rice (£3.25 each). The ribs are one of mine & Michael’s favourite dishes at Eight over Eight; they put Hotbox to shame (not that that’s particularly difficult…). The meat was plentiful and super tender, falling off the bone. 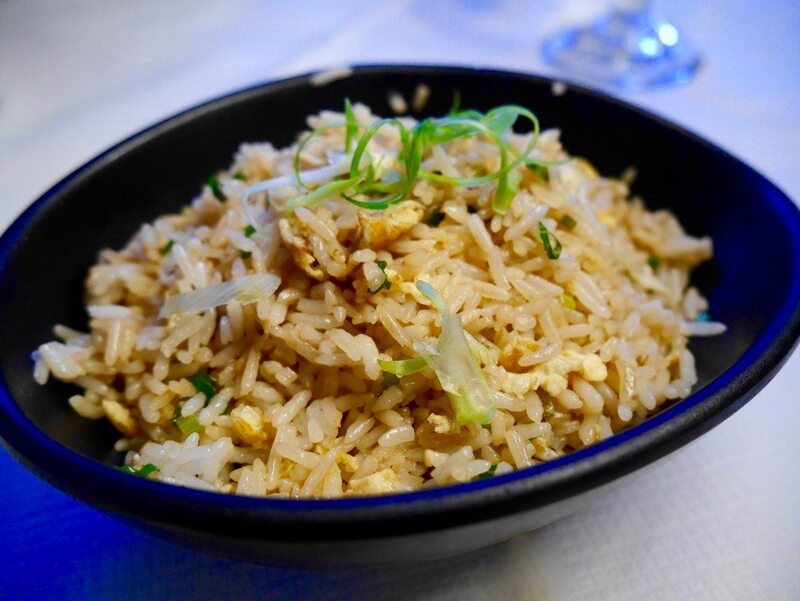 The rich, sticky sauce that they are smothered in is dangerously moreish, but spoonfuls of excellent egg fried rice provide the perfect vehicle for scraping up every last drop. 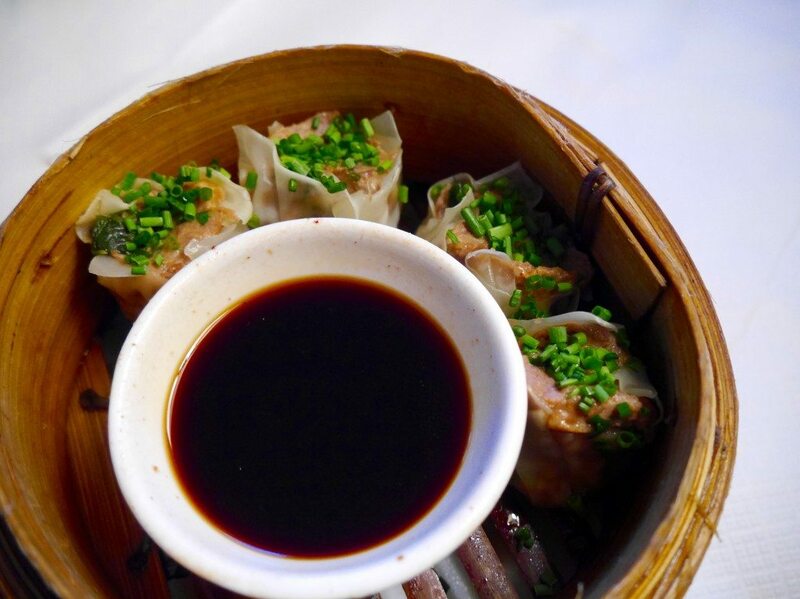 Then there was the duck & spring onion siu mai (£7.00). My GOD these little dumplings were good; fatty duck surrounded by a doughy wall, dipped in the mother of all thick & sweet hoi sin sauces, made for the perfect bite. Dim sum done, we moved on to sushi. 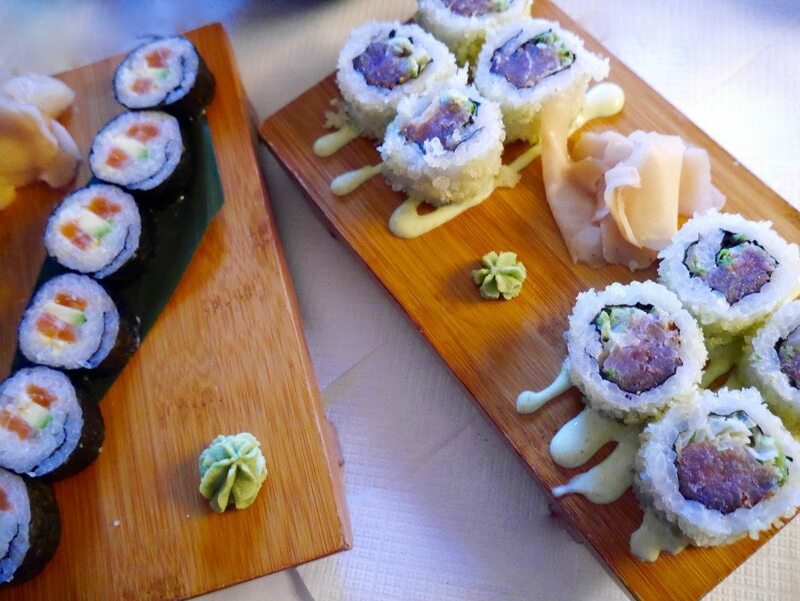 Two orders of spicy tuna ura maki (£8.50 each) and one salmon & avocado maki (£8.50) started us off nicely. 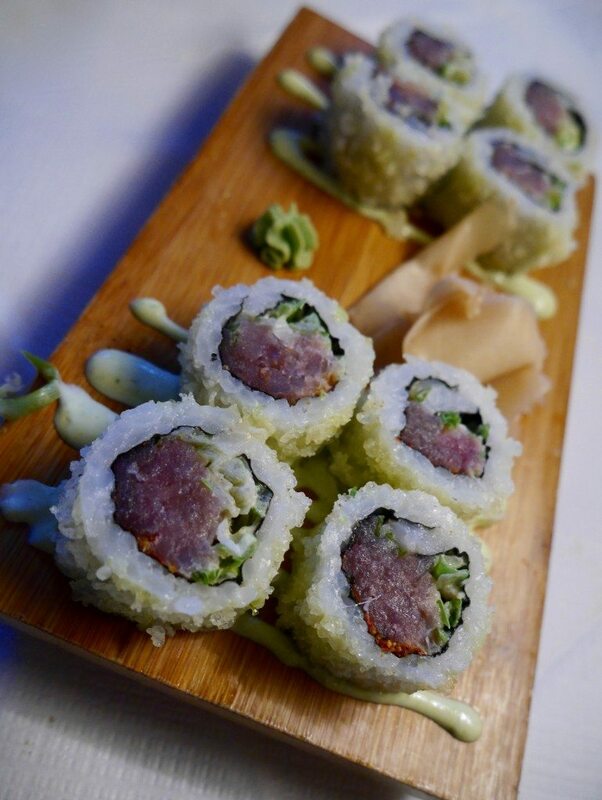 The spicy tuna ura maki was simply sublime. It was by far the superior of the two, which is really saying something as the salmon & avocado maki was still very tasty. Despite not delivering on ‘spice’ (for me, anyway), the inside-out rolls packed a fair-sized piece of silky smooth fresh tuna, which was super delicious contrasted by the crunchy green fish roe and accompanying creamy sauce. The salmon & avocado maki was a common combo done well! Having talked up the next dish that we ordered to William & Hash for days, and looking incredibly forward to it, both Michael and I were a little let down to find that our all-time favourite Eight over Eight dish was not as good as remembered. 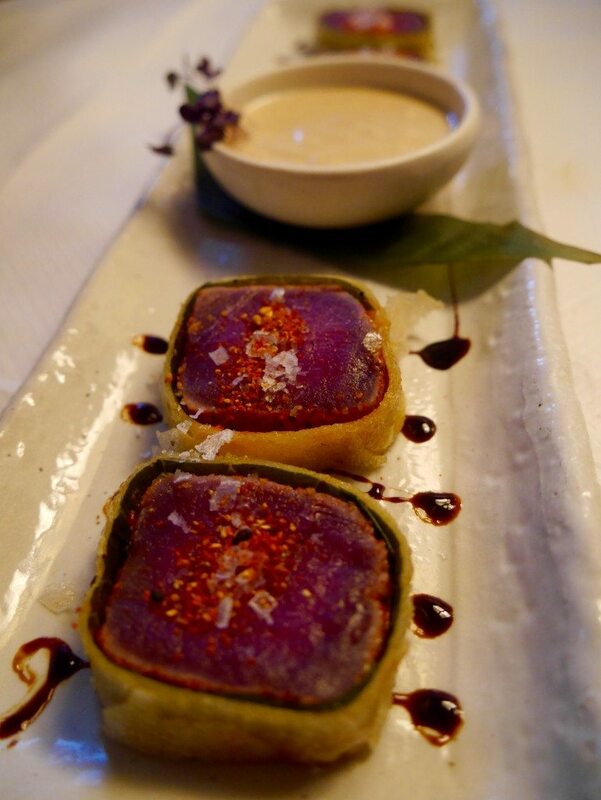 With fond memories, we went straight in with two orders of the seared tuna with miso aioli (£11.00) and, although it was still very nice, it was nowhere near exceptional, as it most definitely used to be. The pastry was a little limp and didn’t pack the same crunch it used to, and the sauce was nowhere near as decadent & thick as we recall. To end the fishy affair we shared the sea bass sashimi, yuzu & truffle oil (£10.50). Incredibly fresh & light, it went down a treat, although slightly out of place with the indulgent evening that we were having to be truly appreciated by myself. Realising that we hadn’t got our greens in (what would mother say?! ), we thought we should order some veg. It still counts if it’s battered, right? 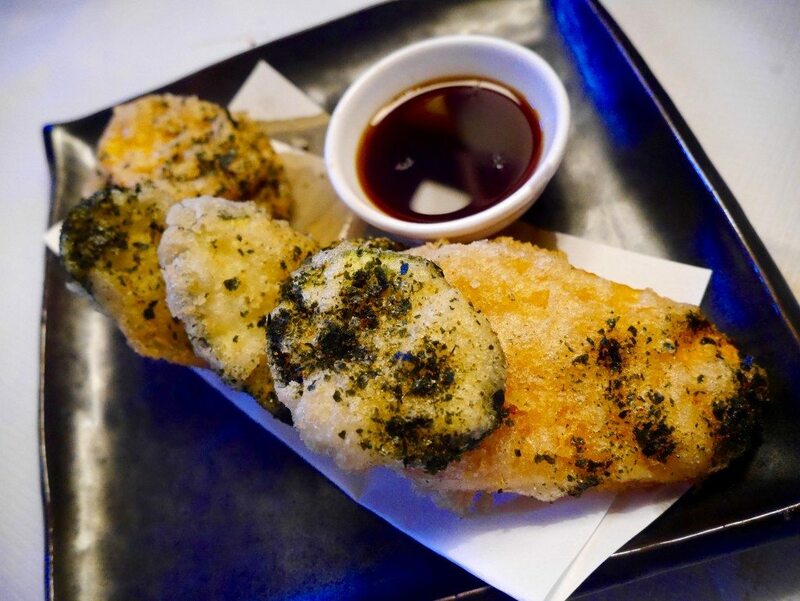 The sweet potato & courgette tempura with lemon ponzu (£7.00) was as good as Michael and I remember, with thick discs of both types of vegetable covered in a light & softly crunchy batter. 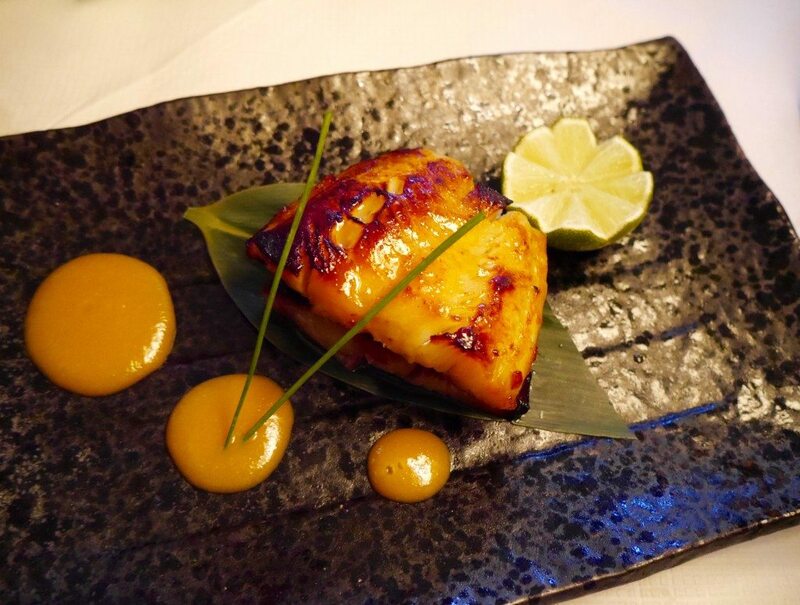 We finished with the holy grail of all Asian restaurants; black cod (£33.00), which unfortunately you always have to pay full price for. 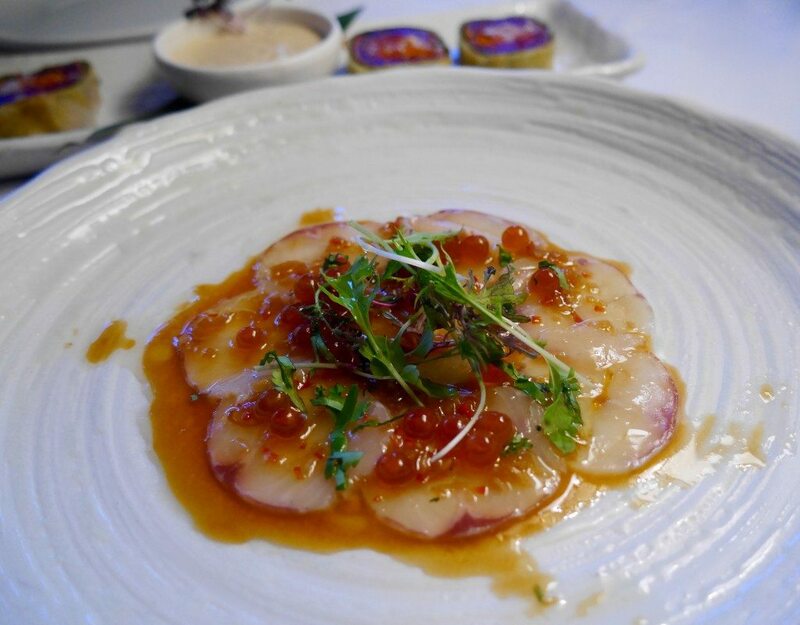 Having had black cod many-a-time (I could happily live off it), and Roka always reigning top of my league, I thought that Eight over Eight’s was a little on the dry side, probably due to the piece of fish being quite thin. The miso sauce, however, was stunning, and of course the black cod was much more than edible when mopping it up. Full to the brim, we asked for the bill. Based on the quantity of food & wine that we had consumed, the restaurant must have taken a shining to us, as a complimentary dessert arrived in the form of a rather tasty ice-cream/sorbet combo. Although not a dessert that I would ever order, it was creamy & refreshing, and I must say that I did quite enjoy it. 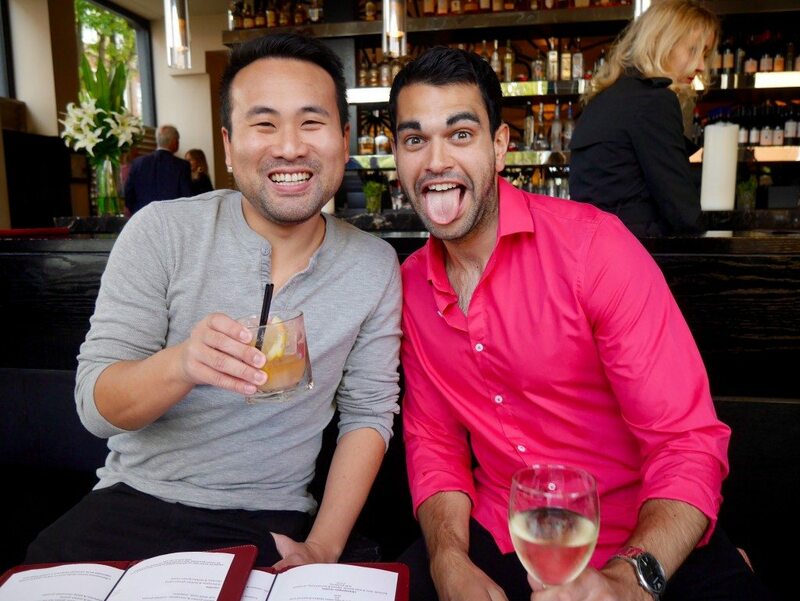 Price: Since an enormous amount of alcohol was consumed, and the wines that we had with dinner were on the higher end of the scale, I will focus on the cost of the food alone. The food bill was £172.50, but with the 40% off offer, it came to £125.70, i.e. £31.43 a head. If you were to add two reasonably priced bottles of wine to the bill + service, you are still looking at under £50 per head, on a Sunday. For the location, the quality of the food, and the quantity that you one can consume at these reduced prices, I think that Eight over Eight is an absolute steal! And since the excellent offer exists, I personally see no reason to go on any day other than a Sunday, but were the offer to disappear, I would probably just about still stop by, but order less… much less… since then the restaurant is encroaching on Roka/Zuma pricing, and the overall finish of an evening at Eight over Eight is not quite in the same refined league. This looks amazing!! I love the look of the gyoza…would you believe I’ve never been here, though I really like the sister restaurant E & O have you tried it?